Right now, though, I’m thoroughly enjoying this year’s fall bounty. I went apple picking again at Russell Orchards, and I’ve been experimenting with new types of squash. Before this year I’ve only ever cooked with butternut and spaghetti squash. Now I’m also cooking with acorn squash and kabocha squash (think of a mix between pumpkin and sweet potato). These particular squashes lend themselves well to stuffing. 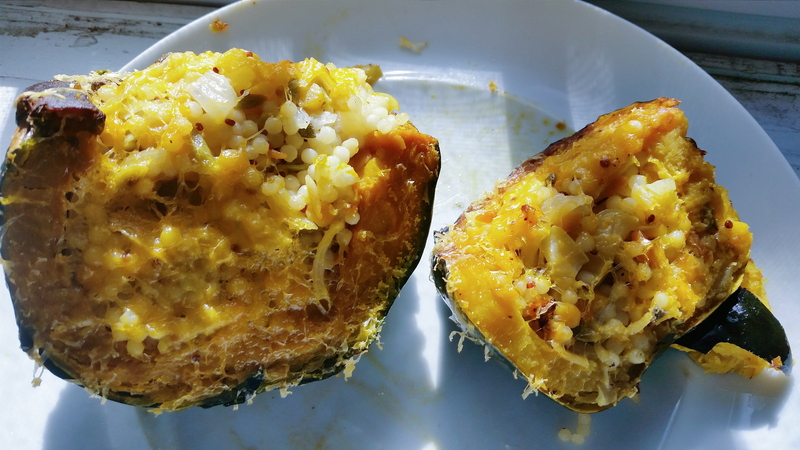 I decided to stuff these squashes with apple, onion, and sage couscous. Grate some cheddar cheese on top, and you have a seriously delicious fall meal. Cut the squash in half lengthwise and scoop out the seeds. Drizzle olive oil on the squash and sprinkle salt, pepper, and garlic powder on top. Flip the squash cut side down onto a baking sheet. Bake at 400 degrees Fahrenheit for 50 minutes or until fork tender. The kabocha squash may take more time to cook. While the squash is roasting, prepare your stuffing. Chop two medium sized apples and one small onion. Add to a skillet with olive oil, salt, pepper, and garlic powder. Sauté for 7-10 minutes. Add minced garlic and chopped sage and sauté for another 2 minutes. Add the couscous to the skillet to let the couscous toast a little. Add water or chicken broth based on the couscous package’s cooking instructions. Let simmer until liquid has evaporated. Once the squash are done roasting, take them out of the oven and flip them back over. Spoon the stuffing into each squash half. Grate cheddar cheese on top of each half and then place back in the oven for another 5 minutes. Enjoy the very best of fall with this comforting dish. Have a wonderful rest of the week, everyone, and I’ll be back soon with more fall favorites!